Business hours: Moon till midnight daily. Perennial comfort food with contemporary touches by chef Amir Shah takes centrestage at T@ste6. WHEN it comes to good food, Chef Amir Shah, who heads the Swiss-Garden Hotel & Residences T@ste6 team, firmly believes that one need not try to reinvent the wheel too much. “Nothing beats good old comfort food,” Amir says at a recent dinner at the hotel’s new contemporary brasserie. In keeping with the fashionably modern ambience of T@ste6, Chef Amir has chosen to offer a selection of contemporary but comfortingly familiar dishes like burgers, steaks, and fish and chips. Each offering is imbued with his own inimitable touches drawn from East and West. You will find the menu varied enough without being overly ambitious. It’s packed with crowd-pleasers that range from soup, salads and snacks to hearty mains comprising pizza, pasta and meaty delights. 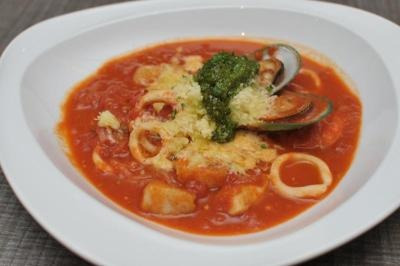 The Mediterranean Seafood Soup with Basil Pesto and Parmesan (RM28++) that starts off our meal is deeply satisfying, brimming as it were with the robust tanginess of sun-ripened tomatoes. I like how the sweetness of the seafood remains discernible on the palate in spite of the pesto’s rich herbaceous nuance. When it comes to jazzing up healthy food, Amir proves that a little imagination can go a long way. Besides lending a touch of wholesome richness to his Orange, Walnuts and Mixed Seeds Salad (RM22++) with labne (a type of Middle Eastern strained yoghurt with a curd-like texture), he perks it up liberally with spiced orange dressing. Amir, whose early forays into the kitchen started when he was 17, recalls how he opted for a culinary career. “I was based in Australia at that time and noticed all these job vacancy ads for chefs. I figured I’d never be out of a job if I too became a chef!” he jokes. “Culinary arts is challenging. It’s never static, and one always has plenty of room to learn, create and try something new. Although I specialise in modern Australian and Mediterranean cuisine, I love cooking simple, comfort food. Of course, I’d give the dishes slight twists to differentiate them as mine,” he explains. Amir’s signature Moroccan Lamb Rack (RM48++) is a good example. Nice and juicy to the core with a blushed pink centre, the meat is flavourful, and we pick it clean from the bone with relish. Problem is, after this excellent speciality, the Roast Duck Breast (RM42++) fails to excite despite the tender slices being prettied up with pink beetroot mash, sherry reduction and sugar snap peas. Tempting: The Mediterranean Seafood Soup with Basil Pesto and Parmesan. The subsequent Pear, Rocket, Walnut and Blue Cheese Pizza (RM27++) is another of Amir’s statement on how the timeless combination of pear, walnuts and blue cheese can be more than just a salad. 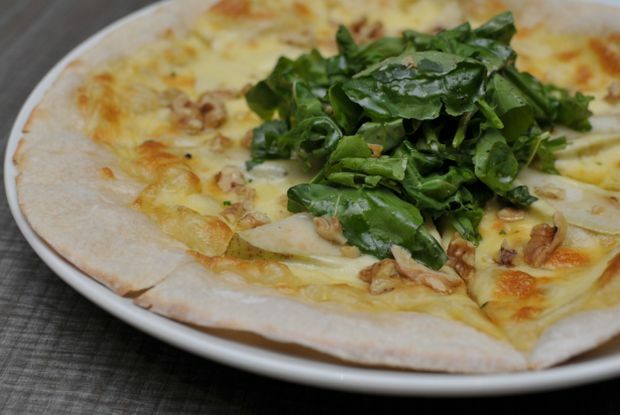 The thin, crispy pizza base amply shows off the pear’s honey sweetness, while the rocket leaves’ peppery accent contrasts nicely with the walnuts’ natural bitterness and the cheese’s metallic brininess. Personally, I’d have liked a drizzle of olive oil and balsamic vinegar over the whole ensemble, to make it moist and nice. Sweet endings are guaranteed with classic confections like Crème Brulee (RM12++) and Lemon Tart (RM12++) on the menu. While I have no cause for complaints about the former, I prefer the latter for its slightly runny but lip-puckering sour curd. It’s heavenly when paired with some vanilla ice cream. T@ste6 also serves an extensive range of cocktails and wines with assorted tapas. It’s a serene spot for those who want to escape from the usual hustle and bustle of the city downstairs, especially with the spacious open-air patio and lounge which gives you a nice view of the city’s skyline. The interior is done up in warm terracotta and mocha hues, and accented with bold, modern art pieces with floral and swirly motifs. And there’s also a vertical “garden” feature wall. Service is personable but be prepared to wait briefly for your food to arrive as chef Amir believes in cooking to order as much as possible. It’s a sure sign of a chef’s pride in his food.